One aspect of the Atari 8 bit computers I never fully understand from a hardware perspective is display list interrupts. In the past I wrote a few custom display lists, but none that used interrupts (non maskable or NMI’s). The extent was mixing graphics modes in programs I wrote. After listening to Rob McMullen’s Player/Missle podcast episode 7 titled “April 81: Gem Drop (Homebrew)” (found here: http://playermissile.com/podcast/ep007.html) with the talk about Super IRG and display lists and interrupts, I wanted to delve further than I had. I set out to do something simple and just change the background color in a few places on a graphics 0 (text) screen to give the appearance of having more than 1 color. This display list is still all graphics 0 (text), but will have 3 lines, color change, 6 lines, color change, 6 lines, color change, 6 lines, color change, 3 lines. To start I set the background color to dark gray. The first color change I set to red, with the next being white, the next being blue, the last being back to dark gray. What I learned, and likely why I never wrote a display list with interrupts, is that an interrupt can only be completed with an assembly routine, and there can be only one. So I had to write an assembly routine to set the background color based on when it was called. Learning Assembly has paid off. This also required a counter, and a list of color codes placed in memory somewhere. The assembly routine to change colors follows. I chose to store the NMI assembly routine in page 6 (memory location 1536). 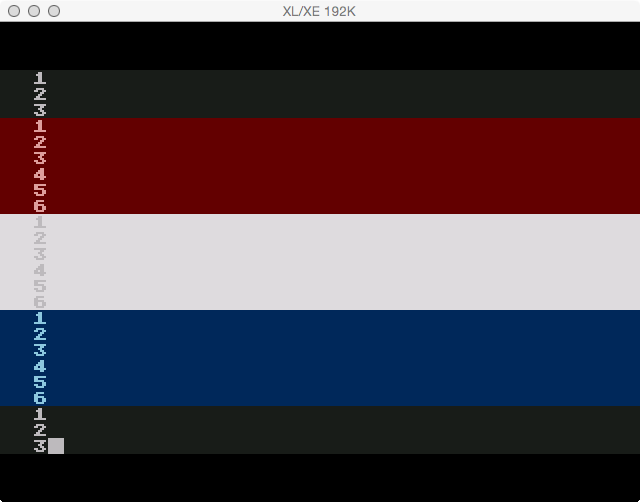 I stored the color values in the cassette buffer, otherwise known as page 4 (memory location 1024). I stored the counter in an used byte at memory location 209. Rather than write a test program in Assembly, I decided to do it in BASIC where I could test out minor changes immediately. Line 15: Set screen to graphics 0. Set text color to intensity 12. Set background color to dark gray. Line 55: Get the address of the display list and store it in variable DL. Line 60: Set the variable NMI to the memory address 1536. Set NL (0) and NH (6) to the low and high byte values needed to reach memory address 1536 from the display list interrupt vector. (6*256) + 0 = 1536. Line 70: Set the variable COLRS to the memory address 1024. Set CL (0) and CH (4) to the low and high byte values needed to reach memory address 1024 from display list interrupt routine (NMI). Line 105: Read each byte of the NMI data and store it in consecutive memory addresses starting at the NMI memory location referenced by variable NMI (1536) by looping through the number of values, reading each one, and poking that value into the current loop iteration offset of the NMI base memory location (think 1536+x). Line 115: The decimal byte values of the instructions from the NMI assembly routine. Line 205: Read each byte of the display list instruction data and store it in consecutive memory addresses starting at the display list memory location referenced by variable DL by looping through the number of values, reading each one, and poking that value into the current loop iteration offset of the display list base memory location. Line 215: The decimal byte values of the display list instructions. Line 305: Read each byte of the color table data and store it in consecutive memory addresses starting at the color table memory location referenced by variable COLRS by looping through the number of values, reading each one, and poking that value into the current loop iteration offset of the color table base memory location. Line 315: The decimal byte values of the color table (gray, blue, white, red). Line 410: Activate the new display list with interrupts by setting the display list interrupt vector low byte (memory location 512) and high byte (memory location 513) to point to the memory location of the NMI (1536 or $0600). Then enable the interrupts by setting memory location 54286 to value 192. Next I will attempt to duplicate this test program in Assembly.